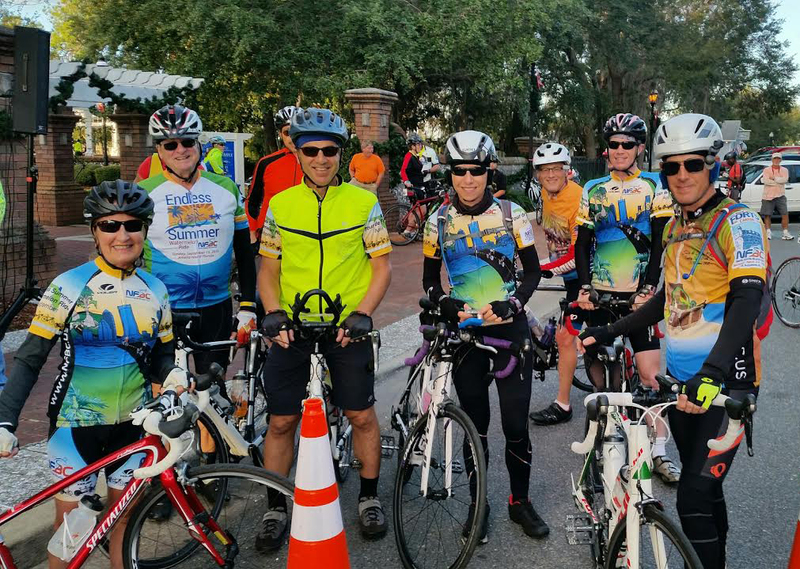 The Travel Team was created to encourage club members to participate in some rides sponsored by other clubs or organizations that require travel outside our home area (Clay, Duval, Nassau and St. Johns Counties). It is hoped that the Travel Team will promote camaraderie among the club’s members while providing greater exposure of the North Florida Bicycle Club and its events such as the Tour de Forts and Endless Summer Watermelon Ride outside our four-county area. Club Jerseys are required to earn club points and mileage. See Rules for exceptions and more details. 1) Register for the ride. 2) Wear an NFBC club- or major event jersey during the event. 3) Sign the NFBC Travel Team ride sheet and follow all NFBC ride rules. Our Travel Team rides are usually one-day events outside our four-county area, but not too far away. Email the Travel Team Captain at travelteam@nfbc.us if you plan to participate. 1) Find a total of five club members who commit to participate. 2) Submit the ride for approval to the Travel Team Captain. The Travel Team Captain or Ride Director will then submit the ride for approval at the next NFBC Board of Directors meeting. Nineteen club members joined the NFBC Travel Team to ride distances from 44 to 103 miles on Sunday and there were also 11 NFBC riders on Saturday. From Palatka, the Sunday 103 mile route traveled through the countryside and over a few hills to the towns of San Mateo, Pomona Park, Welaka and Crescent City. From the canopied roads, there were wonderful views of farms, lakes and the St Johns River. It was a perfect day for riding with perfectly blue skies, temperatures in the 70s, and just a slight breeze from the NE. Make sure you put the Palatka Bicycle Weekend on your NFBC Travel Team to-do list for 2018.
ride with our Georgia neighbors. Fourteen club members participated in the Gainesville Cycling Club’s Santa Fe Century, Horse Farm Hundred, Rush 55 and Horse Farm Tours. Bill Officer and Veronica Lane rode 45-55 miles both days while Michael Kyle racked up 2 more centuries on Saturday and Sunday! Saturday's Santa Fe Century went north from Gainesville through Alachua to just south of Lake City before returning via Worthington Springs with over 2,200 total feet of elevation. The morning started out with a pancake and sausage breakfast for the riders and ended with a lunch spread that included pizza, sandwiches, fried and grilled chicken, pulled pork, sides and ice cream. Wow! On Sunday, the longer Horse Farm rides (57 & 102) started in Gainesville and traveled south, while the 45-mile riders started in the middle of horse farm country. Several first-time riders said that this was the most scenic event they have ever ridden. That’s easy to believe with miles and miles of country roads, pastures dotted by beautiful horses, and sprawling estate homes over the entire route. The hills were even more evident here with over 2,700 feet of elevation gained on the century ride and 1,900+ on the 45-mile ride. Twenty-six club members participated in this event! This ride was mostly on country roads in Baker county with a pass through the Osceola National Forest. The goody bag had a t-shirt, water bottle, and 3 gift cards for restaurants, as well as sports product samples. This event is growing and the organizers are already planning to make next year's ride bigger and better. On June 4, 2016, The NFBC Travel Team joined the Tri-States 100 Century in Dothan, Alabama. For reference, Dothan is a 4-hour drive west from the Jacksonville airport so it was best to drive thereon Friday, do the ride on Saturdayand drive back home on Saturdayafternoon. The Tri-States Century is well supported and well organized. In addition to the 100-mile route, there are also 30, 41, and 69 mile options. The event started with a free, hearty breakfast, signing in and a great swag bag. The bag contained a ride t-shirt, cap and water bottle and the bag itself was a nylon daypack. The venue parking lot was easily big enough to fit the cars of the 400 riders and support staff, so there was no need to arrive extra early to get a good spot. The ride started at7am,but Dothan is located on the far eastern edge of the Central Time zone so the sun was well up in the sky already. The 100-mile course travels through farmland and it is mostly flat with about 2000 feet of easy rolling hills. The most scenic spots were the crossings of the Chattahoochee River, which is the border between Florida/Georgia and Georgia/Alabama. Usually when one finishes a 100-mile ride, the parking lot is nearly empty as most riders just eat and run. However, this does not happen at the Tri-States Century. The parking lot was still full because riders stayed for the great lunch and to pick up their ride medals. Often, events are stingy with the post-ride food, but the staff kept offering more food. Put this ride on your to-do list for the first weekend in June 2017. Our riders went to White Springs for the two-day Suwannee Sweetheart event put on by Jeanne Hargrave and the Suwannee Bicycle Association (SBA). On Saturday, 11 members rode the SBA club ride for 25 or 43 miles, and 8 had lunch together afterward. Some of the weekend riders stayed at nearby motels or camped at beautiful Stephen Foster State Park and enjoyed a potluck dinner at SBA. Sunday morning began chilly, but warmed nicely for the 19 club members who turned out for the Sweetheart Ride. 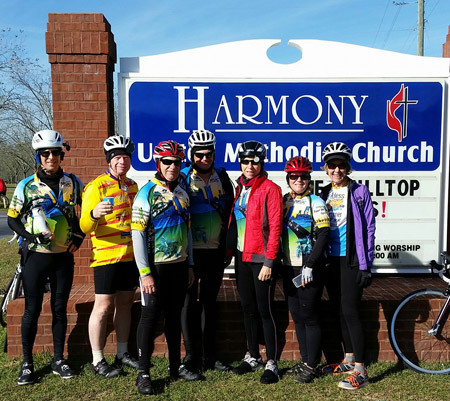 Ten of our riders opted for the full century course which wound through the rolling hills and farmlands of Hamilton, Columbia and Union counties, while the other riders completed challenging routes of 62, 52 and 25 miles. The Highlands Bike Fest is a 3-day event with multiple rides from 10-100 miles each day starting from the historic Keniworth Lodge in Sebring, FL, about 85 miles south of Orlando. Three NFBC members, Bob Fortney (38 miles), Veronica Lane (62 miles), and Ron Harry (100 miles) participated in the Sunday ride on December 5th. The winds were strong that day, but the scenic routes and rolling hills in the country made for a beautiful ride. The catered meal after the ride was first class! 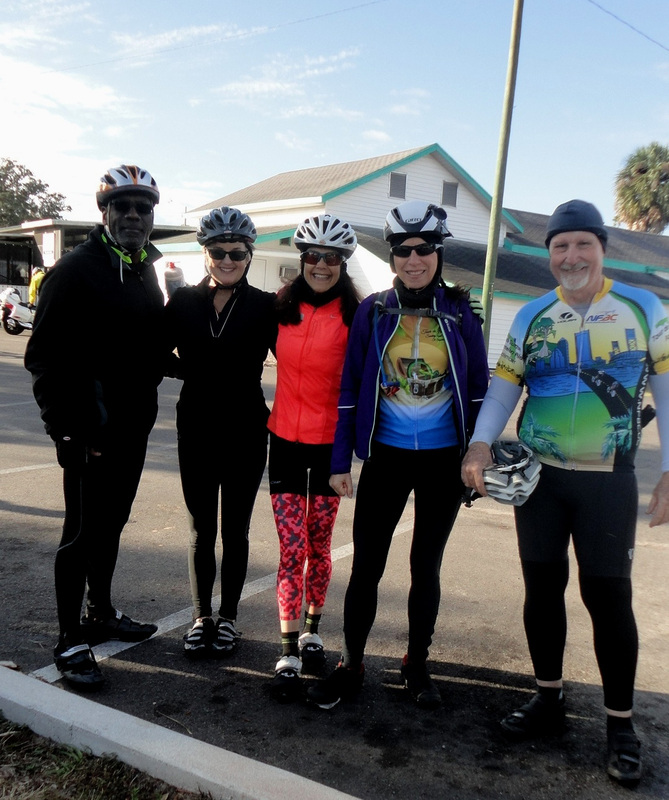 Four club members, Jim Ingham, Ron Harry, Veronica Lane and Ted Lane, rode together for the Intracoastal Waterway Century (ICWC) on 10/24/15. The ride began in the quaint shopping area of Cocoa Village and traveled north along the Indian River before heading up to Titusville. Many of the roads in this area are named after astronauts or spacecraft (e.g. Grissom, Carpenter, and Columbia). After the 2nd rest stop at the American Police Hall of Fame, and a picture taken in front of a shuttle mockup at the US Astronaut Hall of Fame, the riders went east over the NASA causeway to Merritt Island and saw the Vehicle Assembly Building across the water. Veronica Lane, a self-proclaimed NASA/Apollo geek, was very excited to participate in this ride because she spent much of her childhood in the area. Then it was time to head south for 25 miles (nearly the entire length of the island) along several quiet roads with lovely homes and views of the river and Patrick Air Force Base. The only big climb of the day was crossing the Indian River on the hi-rise Eau Gallie Causeway. Then the riders turned north and saw more fabulous waterfront homes on Rockledge Drive before returning to Cocoa Village. This event had excellent, well-placed rest stops (with real bathrooms! ), a post-ride dinner, and a total of 600 riders. Join your NFBC travel team on October 30, 2016 for the ICWC on Florida’s Space Coast.